Acids and bases are two special kinds of chemicals. Almost all liquids are either acids or bases to some degree. Whether a liquid is an acid or base depends on the type of ions in it. If it has a lot of hydrogen ions, then it is an acid. If it has a lot of hydroxide ions, then it is a base. Scientists use something called a pH scale to measure how acidic or basic a liquid is. pH is a number from 0 to 14. From 0 to 7 are acids, with 0 being the strongest. From 7 to 14 are bases with 14 being the strongest base. If a liquid has a pH of 7, it's neutral. This would be something like distilled water. Acids with a low pH of around 1 are very reactive and can be dangerous. The same is true for bases of a pH near 13. Chemists use strong acids and bases to get chemical reactions in the lab. Although they can be dangerous, these strong chemicals can also be helpful to us. *** Never handle acids or bases in a chemistry lab unless supervised by your teacher. They can be very dangerous and can burn your skin. There are many strong acids and bases in nature. Some of them are dangerous and used as poisons by insects and animals. Some are helpful. Many plants have acids and bases in their leaves, seeds, or even their sap. 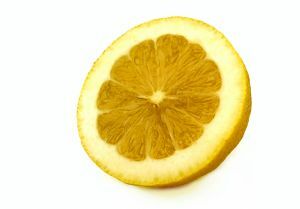 Citrus fruits like lemons and oranges have citric acid in their juice. This is what makes lemons taste so sour. Our bodies use acids and bases too. Our stomachs use hydrochloric acid to help digest foods. 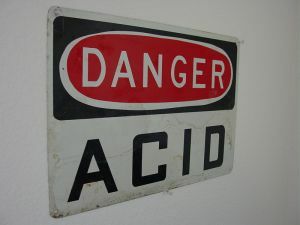 This strong acid also kills bacteria and helps to keep us from getting sick. Our muscles produce lactic acid when we exercise. Also, our pancreas uses a base called an alkali to help with digestion. These are just a few examples of how the chemistry of bases and acids help our bodies function. Science and technology makes good use of acids and bases. Car batteries use a strong acid called sulphuric acid. Chemical reactions between the acid and lead plates in the battery help make electricity to start the car. They are also used in many household cleaning products, baking soda, and to make fertilizer for crops. Acids and bases can help neutralize each other. Acids turn litmus paper red, bases turn it blue. Strong bases can be slippery and slimy feeling. Acids taste sour, bases taste bitter. Vitamin C is also an acid called ascorbic acid. Ammonia is a base chemical.